Bad behavior in anyone does not excuse it in one person, especially someone who is supposed to be an honorable president. Calling anyone names just feeds the energy field that thrives on that judgment, hate and prejudice. This president (who, I think, is deeply flawed and usurped by and immersed within this altered energy field) challenges all of us to speak the truth and not reflect back to him (and each other) the same, disturbed energy he sends out. We have never before been so called to action to speak the truth and act on it. There are so many lies and deceptions coming from the top, it is landing on all of us as a huge slime. And, slime is not cleaned up by more slime. Residing deep inside each of us is a pure, soul-driven core connected to the big energy (God or the un-named Tao) that beats our hearts. We all know the truth deep inside. We just have forgotton how to listen to that core where truth dwells. We have let the false “gods” version of what is true layer us with slime. Clean it up from the inside out. Release old false, rigid, made-up notions. Open your mind. Reduce the slime wherever and whenever you can. 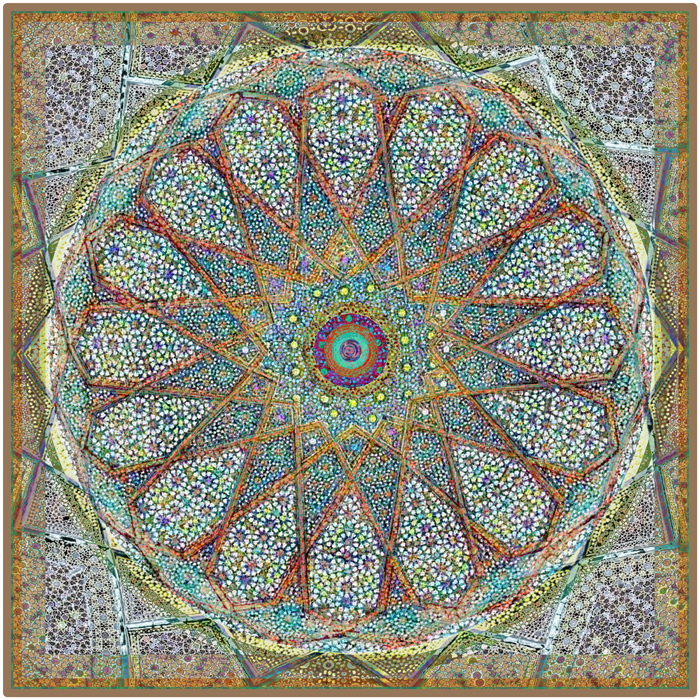 This entry was posted on August 15, 2018 by Elsah in Mandalas.